I have had this book on my TBR list for over a year and a half. I wanted to read it over the holidays, but in typical holiday fashion, things came up and I didn't get around to it. With Summer Days and Summer Nights being released May 17, 2016, I needed to tackle this one before I found myself even further behind. I downloaded the audio book from the library and listened to the first five or six stories while I trained for my next half marathon. Each story is about 50 minutes long, which helped push me a little further than the 35 - 40 minutes I had been running each day. I listened to the last half of the book during my five hour drive to BEA and the time literally flew by. The stories were all very different and I enjoyed seeing how the various authors expressed their personalities and styles. I have read several books by Holly Black, Ally Carter, David Levithan, Stephanie Perkins, and Rainbow Rowell, but the rest of the authors were new to me. Not new to me in the sense that I haven't heard of them, but rather they have been on my TBR list forever and I simply haven't gotten around to reading their books yet. I was really impressed with Kiersten White and Gayle Forman's stories and will have to bump their books further up my TBR list. 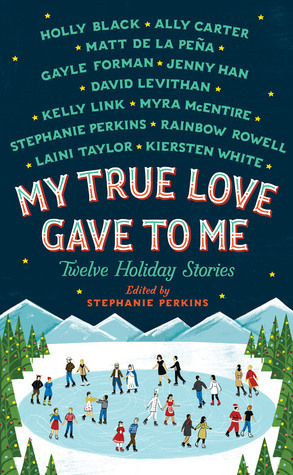 Overall this was a very entertaining collection of stories that will put anyone in the holiday spirit. I would, however, recommend taking a break between each story to allow yourself time to process what you have read before moving onto the next. When I listened to the stories back to back in the car, I found the transitions to be a bit awkward. It was more enjoyable for me when I started each story with an open mind. For example, moving from a contemporary romance to a supernatural story involving a mysterious disappearing elf was easier to process when I listened to them independently.